As I quickly walked down the driveway, I saw a few worms crawling along the cement. It was easy to avoid stepping on them as I forged ahead. But as I headed into the street, it was crawling with worms. Hundreds of them up and down the street. Some were fat and large and “quickly” slithering along the wet pavement. Some were slender and long and moving with difficulty. And some were unfortunate smashed casualties of vehicles driving over them. I quickly knew why the air was thick with a pungent wormy odor. After trekking up the street, I debated continuing along the wormy roads. To hustle ahead, I had to concentrate on the road beneath my feet with its crawling creatures. That was uncomfortable and unappealing. I decided to keep going, but do that carefully. I did my best to avoid stepping on the small slithering animals. They’re alive and I have no interest in harming them. As I reminded myself these “low riders” are living beings, I wondered whether they have a heart, too. After returning home, I looked online and was amazed to find they typically have five hearts. Wow, what a surprise! 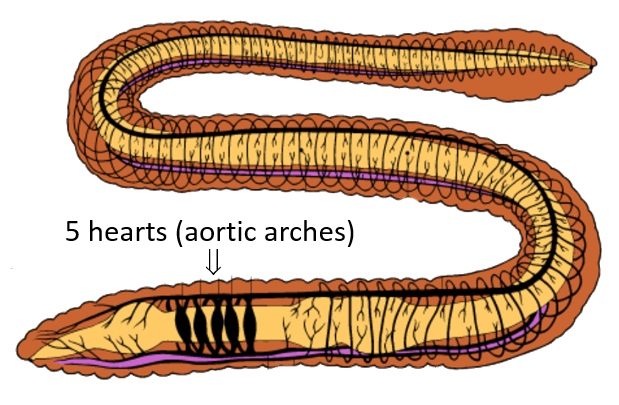 Some of their cardiac pumps move blood to the front of the worm’s body, and some move it to the back of the long, narrow body. I can’t imagine living with five heartbeats! Can you? What do you think about worms’ five hearts?